The participation of American Paige Spiranac, known more for her social media skills than golf, in the Omega Dubai Ladies Masters is dividing opinions. There are some like the legendary Laura Davies, who may not have said it in so many words, but made her displeasure known when she said she did not “know her from a bar of soap”. It’s not as if Davies was feigning ignorance. Given her experience of Facebook or Twitter, which is shockingly close to zilch, she can be pardoned for having no idea who Paige Spiranac is, but that surely isn’t the case with most people constituting Generation Y. For the uninitiated, Spiranac is a golfer who had done well for San Diego University before turning professional this year. She has won a couple of events as a college player, but does not have a card on any Tour. She does aspire to be on the LPGA Tour, and is working towards that goal. And yet, despite not playing even one professional tournament so far – the Dubai Ladies Masters is her pro debut – she has more followers on Instagram than world No1 Lydia Ko (38,800 followers), No3 Lexi Thompson (109,000) and Michelle Wie (the most popular lady golfer with 176,000 followers). Just 95 posts so far have earned her more than 474,000 devotees, as well as a sponsor’s exemption in Dubai Ladies Masters, a decent contract with Callaway, coverage in Golf Digest and air-time on The Golf Channel. There may be question marks about her golfing ability, and it will be cruel to pass judgement without seeing her in action in her first professional appearance on Wednesday, but there is no doubt that Spiranac connects with the Millennials – the demographic every sport organiser, or sponsor, is trying to entice. Given that, you really can’t blame the organisers for inviting Spiranac, even though there will be many who’d always think another player from the Tour, or an amateur from the region, would have been a better and more deserving choice. So, there are two ways of looking at how successful her participation has been. Either we look at her scores, or we look at the internet hits that she has generated for the tournament. From a Sport360 point of view, our pre-event story on Spiranac, retweeted by her, generated the most number of likes ever for any women’s golf story we have published. There is a possibility that Spiranac won’t event make the cut, but should we treat that as failure? It will have to be measured against the fact that this is only her debut as a professional, and that she is making her first trip outside America. Just for the sake of comparison, Tiger Woods and Rory McIlroy – two of the greatest golfers of recent times – did make the cut in their professional debut. McIlroy was tied 42nd in the 2007 British Masters, while Woods was tied 60th in 1996 Greater Milwaukee Open. But what about them playing in a professional tournament for the first time ever? Woods actually missed the cut in his first seven starts on the PGA Tour, while McIlroy had to wait for two years before making his first cut in a professional tournament – at the 2007 Dubai Desert Classic. Really, if Spiranac makes it to the weekend, it will be a fantastic achievement for her. And even if she doesn’t, the move to invite her to play will go down as fantastic, out-of-the-box thinking by the organisers. Region’s best: Some of the entrants. Some of the finest young talent in the region will be seen in action when the Emirates Golf Federation (EGF) hosts the Junior and Ladies Arab Golf Championship at Al Ain Equestrian Shooting & Golf Club (AESGC) from Friday. The three-day event will have three different divisions – 18 and under, 15 and under, and ladies – and players from 10 different Arab countries will be participating. The countries to be represented include Bahrain, Egypt, Jordan, Kuwait, Lebanon, Morocco, Qatar, Saudi Arabia, Tunisia, and host country UAE. A total of 70 players are expected to take part in the three categories. The UAE will have players in all three divisions, as well as an extra player in the individual ladies category. Playing in the U18 team will be Ahmed Skaik, Obaid Al Heloo, and Saeed Al Balooshi, while the U15 team will comprise of Mohamed Al Hajiri, Mahmood Skaik, and Khalil Kashwani. Last year’s runner-up, the UAE Ladies team will have Dr Rabab Al Haj, Tara Al Marzooqi, and Reema Al Heloo. Hamda Al Suwaidi will be playing for the UAE in the individual ladies category. There will be gold and silver winners for the team and individual categories in all three divisions. For the teams, the final score will consist of the top two gross scores out of three players each round, totalled after three rounds. The individual category will be scored as the best individual gross score from each division. The Championship will kick off with an opening ceremony tonight, which will be graced by the Arab Golf Federation and Emirates Golf Federation chairman, HE Sheikh Fahim Bin Sultan Al Qasimi. Khalid Mubarak Al Shamsi, EGF Secretary General, said: “This tournament builds bridges of understanding and brotherhood among all representing countries of the Arab golf world. The 16th edition of Junior Arab Golf Championship and the seventh edition for Ladies Arab Golf Championship is being played under the aegis of Arab Golf Federation. The host club AESGC is an 18-hole championship course that offers a scenic and perplexing experience for all golfers. With yardages tipping out at 6,839 this challenging course, located in Oasis City, Al Ain, should be a perfect venue for these skilled young amateur golfers. You could be a hole lot richer: The Dh1m putt competition will be popular. The action promises to be non-stop at this week’s Omega Dubai Ladies Masters, where apart from watching the finest players on the Ladies European Tour vie for the trophy, fans can enjoy the spruced up Championship Village. Not only are there some great activities for the entire family and new food and beverage offerings, there is also a fabulous cash prize of Dh1 million on offer for the winner of the Emirates NBD Million Dirham Putt competition. Of course, the best part is that all this is for free, as there is no entry ticket for the tournament. 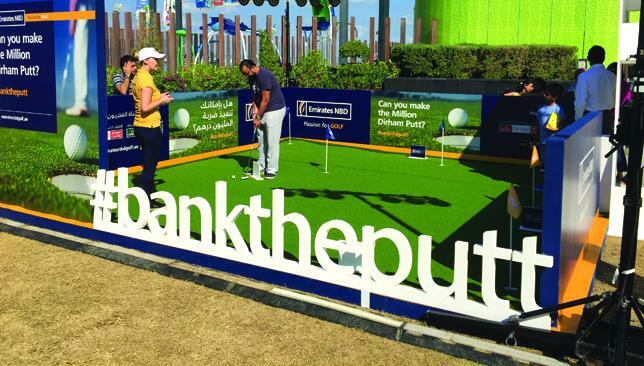 As part of their sponsorship of the Dubai Ladies Masters and the Dubai Desert Classic, the Emirates NBD campaign comes to Championship Village after it was opened at JBR-The Beach last month. The Dubai Ladies Masters gets underway on Wednesday, while the Dubai Desert Classic will be played from February 4 to 7 next year at Emirates Golf Club. The unique putting competition will test amateur skill and beginners luck with participants putting their way around a specially-designed surface. Daily champions will progress to one of the two play-offs to be held on the final day of each tournament. of the Dubai Desert Classic. The ultimate champion will earn the opportunity to make a tricky 60-foot putt on the ninth green for winning the million dirham cash prize in front of thousands of fans at the Majlis Course. Apart from the million dirhams, fans can also win weekend test drives in the latest Mercedes Benz models by participating in a chipping competition. A couple of new attractions this year at the Village include a free 20-minute facial treatment for every visitor from Discover Institut Esthederm, and a climbing wall and rope quest area created by Adventure HQ. Among the new F&B outlets that will be part of the Championship Village are BurgerFuel, 800 Pizza, Gelato Divino and a Smokehouse BBQ and Red Bull Zone.